Staff was very friendly and helpful. Bed was comfortable, internet and cable worked well. For doing business in the capital it is perfect and in the middle of everything. 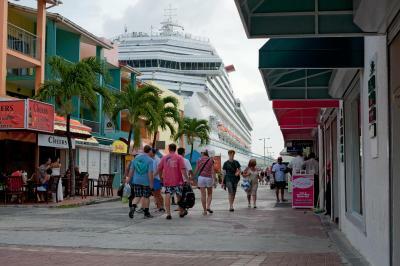 Close to restaurants, bars, banks, shopping and the cruise ship dock. Very safe to walk around. Room is nice and spacious and mini fridge/coffee maker both worked well. AC worked well and cooled the room without a problem. This hotel works best for business travelers on short stays or leisure travelers in transit. The location is great in the heart of the city, near to good dining and shopping. The staff was friendly and courteous. The room was nice and clean, and service to the room was regular daily.. The location in the heart of town was great. Housekeeping was very good. I liked the wide breakfast selection and the quality of the food. The staff were also very accomodating to my requests. The location is quite central which has its pros and cons but for my trip the pros outweighed the cons. Room was really big with fridge , plenty of cupboards and storage, coffee making facilities, and huge comfy bed , balcony, everything we could have wanted and more x staff were excellent. An upgrade of facilities is it required. Staff were nice and location was too. the location is great. the view overlooking the harbour, from the dining room is awesome. Location was really good. Hotel was located in the city centre which made it quite accessible to any amenities you needed and more. Great location in St Johns by the quay. It's not near a beach but allows you easy access to tours and to explore the island. Therefore if you don't want to lie on the same sun-lounger everyday it's a great choice. The lady that ran reception was always helpful and charming. Very large bedroom, with huge balcony! Featuring spectacular views of St. John’s Harbour, and free Wi-Fi, the Heritage Hotel is 900 feet from Antigua and Barbuda Museum and 1,650 feet from St. John’s Cathedral. The rooms offer a basic décor and include air conditioning, telephone, TV and a kitchen. The bathrooms are private and come equipped with a shower and bathtub. The Flamboyage Restaurant serves local, Asian and international cuisine. There are also several restaurants within less than half a mile. The Heritage Hotel is a 5 minute drive from Jolly Harbour Marina and a 4 minute drive from Antigua Recreation Ground. The VC Bird International Airport is 4 miles away. This room has free Wi-Fi, air conditioning and TV. The bathroom is private and has a shower or bathtub. It has a kitchenette and a sofa bed. This room has free Wi-Fi, air conditioning and TV. The bathroom is private and has a shower or bathtub. This room has free Wi-Fi, air conditioning and TV. The bathroom is private and has a shower or bathtub. It has a kitchenette. House Rules Heritage Hotel takes special requests – add in the next step! Heritage Hotel accepts these cards and reserves the right to temporarily hold an amount prior to arrival. Location, size of room and staff. the elevator needs to be replaced. the bathrooms need to be upgraded. Rooms are dated and need to be deep cleaned. The hotel when you walk into the entrance smells like a bathroom. I suggest to the owners since you are really the only hotel in St. Johns, pump some money into it and fix it up. The property has alot of potential. Deep Clean place and fix up the restaurant very off putting. Balcony door could not open. I worked in hotels for over 10 years and I am not fussy but this place needs a serious face lift. My room door did not lock properly, with force someone could open it. As it was a Sunday shops and restaurants were closed therefore there were very few places to choose from when it came to dining. The lift was a bit temperamental and intermittently broken! The shower did not work, there was no WiFi in the rooms, only in the lobby, and the restaurant was dirty. The housekeeping attendant was kind, but the front desk person when I checked in was rude. Above the world's loudest bar. Luckily the music stopped about 9. Then the 'heated arguments started. Bath/shower could do with updating, as could the number of useable plug points. Staff are friendly & helpful. Gave me a booster when the Wi-Fi failed. Good for directions too. The elevator is too small, and was down every day. Walking to the fourth floor was good exercise, but not when coming in late at night. Breakfast was poor for the price, but there were some great eateries nearby. The bed was too soft and needs changing. Staff and location are excellent.